Red-necked Stint: Breeds on tundra in arctic northeast Siberia; migrates through Siberia, Mongolia, China, Japan, and southeast Asia to Australia. Preferred habitats include saline sand bars and tidal mudflats along coasts. The Red-necked Stint is a small, migratory wading bird. Typical breeding grounds may be found in Arctic tundra regions of eastern Europe and Asia, and non-breeding seasons are spent in southeastern Asia, Australia, Tasmania and New Zealand. This species may also rarely be found in western Europe, but is often found in western Alaska and in the Americas. Nests are built on the ground, and Red-necked Stints form small flocks while migrating. 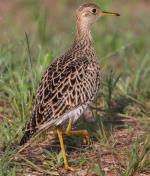 They forage for food such as insects and small invertebrates in grassland and soft mud. 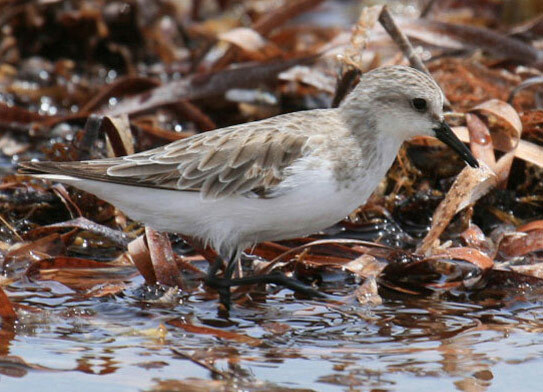 The current conservation rating for the Red-necked Stint remains at Least Concern.